We were all so excited upon seeing the sign on the river! We are about to enter Tanjung Puting Area! (meaning: no cell phone signal! But it's something that we groaned and moaned later on. Yeah. Technology. Can't live without 'em!) Our first stop: Tanjung Harapan! 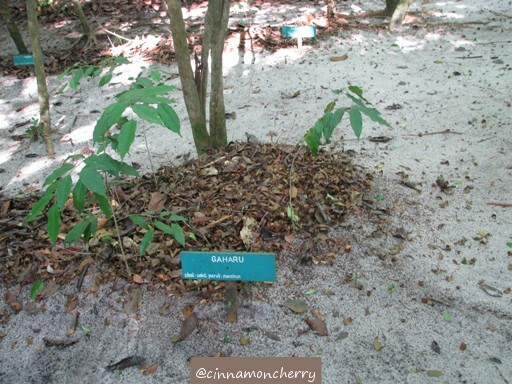 My first thought upon entering this area: my, my, the soil around this place is sandy and whitish. There are also some plants with medicinal properties planted here. We visited information center and read tidbits about this area. 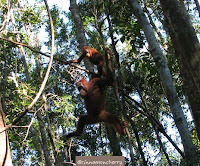 Then we enjoyed a short trek (about 1 kilometer) to the feeding site of orangutans. 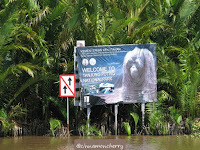 The first orangutan that I saw in this area! A she, unfortunately I forgot her name. 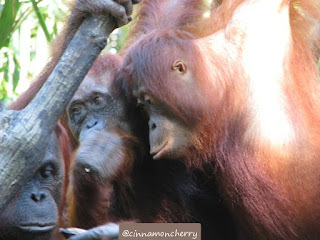 (Yes, the orangutans have names! The researchers and rangers and some guides can tell them apart. Me? Apart from the dominant male, they look too similar.) She was munching so many bananas and pushing more and more into her mouth. I thought she was greedy. But actually she was afraid that the dominant male, the king of the area, would come and naturally demand his hefty share. So she was being smart. She couldn't bring the bananas using her hands or legs, since she would use them to climb trees. Her mouth was a logical choice. Since the king was nowhere in sight, more females and young males braved themselves to eat the bananas. Most males were bringing their young ones with them, clinging while they were approaching the ground, but when they were up in the trees, some youngsters climbed around happily (though they still didn't dare to go too far from their moms). Some orangutans even ate together, peacefully. Maybe this was like some kind or arisan or gathering of the mothers! 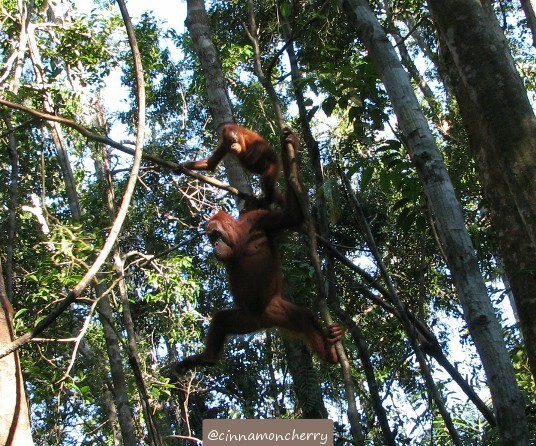 Here you can see a female orangutan with her child, up in the trees. They are agile climbers. They are also strong! It is said that a female orangutan is as strong as four grown men. A male orangutan is about as strong as eight grown men. The king of orangutan (orangutans have kings. One king rules a relatively small area.) is of course much stronger than that. 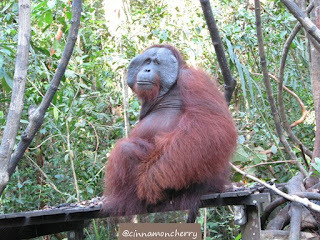 One ranger told me that it took about 20-ish men to subdue a king of orangutan when he needed treatment for his wounds. 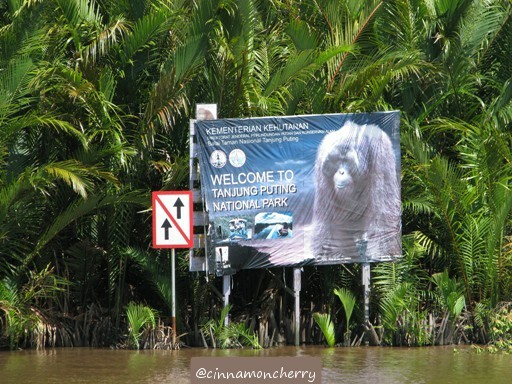 We were so lucky, the guides told us, since the kings of orangutans were not always seen by visitors. The feeding site is filled daily, but this is not a staple diet for them. Sometimes aside of bananas, they will give orangutans milk. 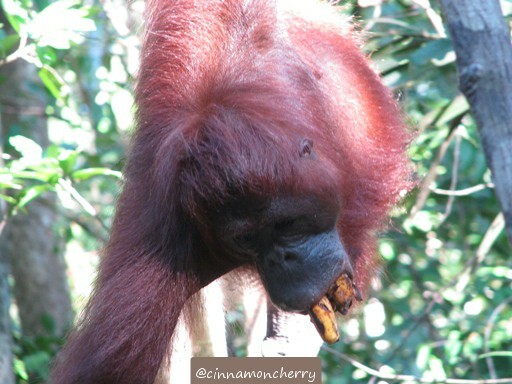 When the trees are yielding fruit, however, only few orangutans can be spotted since they prefer to eat elsewhere. - DO NOT LITTER. Bring your own garbage with you. - DO NOT EAT OR DRINK IN FRONT OF THEM. They might be tempted to grab them from you and this might cause health problems for them. - DO NOT FEED THE ORANGUTANS! They are not pets, here they are expected to be self-sufficient and to be able to survive in the wilderness. - KEEP YOUR DISTANCE. At least 5 meters away. -IF YOU ARE SICK, STAY AWAY FROM THEM. They might be infected! 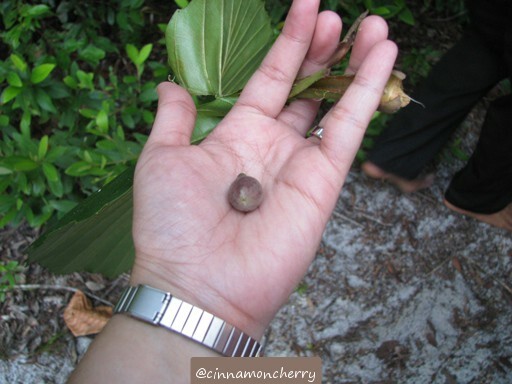 During our trek to our kelotok boat, one guide showed me a small tree called ramunting (?). He said orangutans loved to eat it. Edible for humans too, since the guide has tried it many times. He picked one for me and I tasted it. It's like guava, albeit a bit bitter. Sepertinya maksudnya Karamunting.. (Kerimunting di lagunya Laskar Pelangi.. Harimonting di bukit2nya tanah Batak :D) hehe..
Memang ada sih disebutkan pohon Karamunting. Tapi seingatku dua kali pemandu menyebutnya ramunting. Disingkat kali ya? Not bitter at all, Dave. Yah pisang sih enak. Tapi kan jarang ditemui di hutan.